· A match may not start if either team consists of fewer than three players. · The match is abandoned if one of the teams has fewer than three players on the pitch. · Shorts- The goalkeeper is permitted to wear pants. · Shin guards are mandatory- must be entirely covered by the socks. · Futsal shoes, or footwear of canvas or soft leather training or gymnastic shoes with soles of rubber or a similar material. No cleats allowed. · U12’s and under will play with a Futsal size 3 ball. · U13’s and above will play with a Futsal size 4 ball. 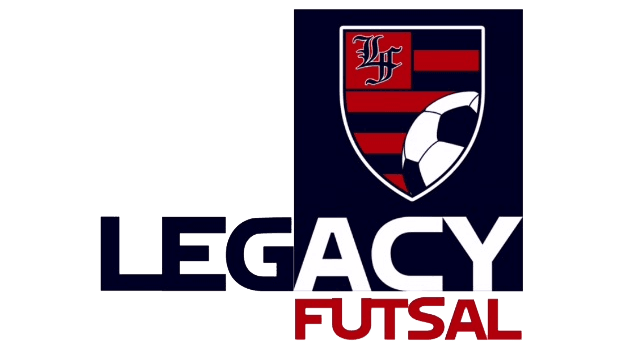 · Legacy Futsal will provide the game ball. · The player leaves and enters the pitch via his own team’s bench area. · The substitute only enters the pitch after the player being replaced has left. · If a substitute enters the pitch before the player being replaced has left or, during a substitution, a substitute enters or leaves the pitch from a place other than his team’s substitution zone the referees may caution him or her for infringing the substitution procedure. Same rules apply for goalkeepers. · A substitute player may replace a sent-off player and enter the pitch two full minutes after the sending-off, provided that he has the authorization of the referee or assistant referee, unless a goal is scored by the opposing team before the two minutes have elapsed. In which case the player may go in. · The match lasts two equal periods of 24 minutes of running clock. · Players are entitled to a 2-minute interval at half time. · After hearing the referee’s whistle or the timekeeper’s acoustic signal the game is over. Unless an indirect or direct free kick has been awarded, in which case the period in question is extended until the kick has been taken. · If the ball has been played towards one of the goals, the referees must also wait for the kick to end. · During the last 30 seconds of the game the referee may stop the clock if a player or a team is deliberately time wasting. · The visiting team kicks off to start the first half. The home team kicks off to start the second half. · A goal may not be scored directly from the kick off. If done so, the opposing team is awarded a goal clearance. · The ball is in play when it is kicked and moves forward. · The ball is out of play when it fully crosses any of the boundary lines or if it hits the ceiling. If the ball hits the ceiling wile in play, the game is restarted with a kick-in taken by the opponents of the team that last touched the ball. The kick-in is taken from the point on the touchline nearest to the place on the ground above which the ball hit the ceiling. · There is no offside in Futsal. · Opponent must be at a distance of no less than 5m. from the place on the touchline where the kick-in is taken. · The ball must be stationary and kicked from the point where it left the pitch. · Player must deliver the ball within four seconds of being ready to do so. · A goal may not be scored directly from a kick-in. · If, when a kick-in is taken, an opponent is closer to the ball than the required distance the kick-in is retaken by the same team and the offending player is cautioned, unless the advantage can be applied or an offense punishable by a free kick or penalty kick is committed by the opposing team of the player taking the kick-in. · For any other infringement of the procedure for the kick-in, a player of the opposing team takes the kick-in. · A goal may not be scored directly from a goal clearance. · The opponents must be on the pitch and outside the penalty area of the team taking the goal clearance until the ball is in play. · The goalkeeper of the defending team takes the goal clearance within four seconds of being ready to do so. If the goal clearance is not taken within four seconds an indirect free kick is awarded to the opposing team, to be taken from the penalty area line at the place nearest to where the infringement occurred. · The ball is in play when it is thrown directly out of the penalty area by the goalkeeper of the defending team. If the ball is not thrown directly out of the penalty area from a goal clearance the clearance is retaken. · Goalkeeper cannot throw the ball over the halfway line unless it touches the pitch or another player first. If done so, an indirect free kick from the centerline is awarded to the opposing team. · A goal may be scored directly from a corner kick. · The opponents must be on the pitch at least 5 m. from the corner until the ball is in play. · The team taking the kick must deliver the ball within four seconds of being ready to do so. · If, when a corner kick is taken, an opponent is closer to the ball than the required distance, the same team retakes the corner kick and the offending player is cautioned. · If the corner kick is not taken within four seconds a goal clearance is awarded to the opposing team. · Are those penalized with a direct free kick or penalty kick. · The referees may allow play to continue by applying the advantage if the team has not previously committed seven accumulated fouls and the opposing team is not denied a goal or an obvious goal scoring opportunity. · If they apply the advantage, the referees will indicate an accumulated foul as soon as the ball is out of play. · All opponents must be at least 5 m from the ball until it is in play. · A goal can be scored only if the ball subsequently touches another player before it enters the goal. · If an indirect free kick is kicked directly into the opponents’ goal, a goal clearance is awarded. · An indirect free kick conceded in the penalty area is taken from the penalty area line at the point nearest to where the offence was committed. · If a player commits his team’s seventh accumulated foul in the opposing team’s half or in his own half in the area bordered by the halfway line and an imaginary line parallel to the halfway line passing through the second penalty mark, the free kick is taken from the second penalty mark. · If a player commits his team’s seventh accumulated foul in his own half of the pitch between the imaginary 10 m. line and the goal line but outside the penalty area, the attacking team decides whether to take it from the second penalty mark or the place where the infringement occurred. · The goalkeeper stays at least 5 m. from the ball. The players, except the kicker and the defending goalkeeper, remain behind an imaginary line that is level with the ball and parallel to the goal line and outside the penalty area, at a distance of 5 m. from the ball. They may not obstruct the player taking the free kick. No player, except the kicker, may cross this imaginary line until the ball is in play. · If the team taking the free kick takes more than four seconds the referees award an indirect free kick to the opposing team, to be taken from the place where play was to be restarted. · Controls the ball with his or her hands or feet in his or her own half of the pitch for more than four seconds. · After playing the ball, he or she touches it again in his or her own half of the pitch after it has been deliberately played to him or her by a teammate without an opponent playing or touching it. · Touches the ball with his or her hands inside his own penalty area after it has been deliberately kicked to him or her by a teammate. · Kicks or attempts to kick an opponent. Trips an opponent. Jumps at an opponent. · Strikes or attempts to strike an opponent. · Spits at an opponent. · Handles the ball deliberately (except for the goalkeeper within his own penalty area). · Slide tackles an opponent. · Goalkeeper controls the ball with his or her hands or feet in his or her own half of the pitch for more than four seconds. · Plays in a dangerous manner in the presence of an opponent. · Impedes the progress of an opponent. · Prevents the goalkeeper from releasing the ball from his hands. A player or substitute is cautioned if he or she commits any of the following offences. · Dissent by word or action. · Persistent infringement of the Futsal Laws of the Game. · Delaying the restart of play. · Failure to respect the required distance when play is restarted with a corner kick, free kick, or kick in (defending players). · Leaving, entering, or re-entering the pitch without the referees’ permission or infringement of the substitution procedure. · Spitting at an opponent or any other person. · Denying an obvious goal scoring opportunity to an opponent moving towards the player’s goal by an offense punishable by a free kick or a penalty kick using offensive, insulting, or abusive language and/or gestures. · Receiving a second yellow card in the same match. Each match is controlled by referees who have full authority to enforce the Futsal Laws of the Game in connection with the match to which they have been appointed. · Enforce Legacy Futsal Laws of the Game. · Ensure that any ball used meets the requirements of the game. · Ensure that the players’ equipment meets the requirements of the rules. · Keep a record of the match. · Stop the match, at their discretion, for any infringements of the Legacy Futsal Laws of the Game. · Allow play to continue until the ball is out of play, if a player, in their opinion, is only slightly injured. · Ensure that any player bleeding from a wound leaves the pitch. The player may only return on receiving a signal from the referees, who must be satisfied that the bleeding has stopped. · Allow play to continue when the team against which an offense has been committed stands to benefit from such an advantage and penalize the original offense if the anticipated advantage does not ensue at that time. · Punish the more serious offense when a player commits more than one offense at the same time. · Punish the more serious misconduct when a player commits more than one act of misconduct at the same time. · Take disciplinary action against players guilty of cautionable and sending-off offenses. They are not obliged to take this action immediately but must do so when the ball next goes out of play. · Ensure that no unauthorized persons enter the pitch. · Provide the appropriate authorities with a match report, which includes information on any disciplinary action taken against players and/or team officials and any other incidents that occurred before, during, or after the match. · The decisions of the referees regarding facts connected with play, including whether or not a goal is scored and the result of the match are final. The referees may only change a decision on realizing that it is incorrect. · Each team is entitled to a single 1-minute time-out per half when the team is in possession of the ball and the ball is out of play. · Teams must switch benches at half time. Team bench is located always on the defending side. · Goalkeeper may not throw the ball over the halfway line at any time. Goalkeepers may not throw the ball directly into the opposing goalie penalty area. · Direct free kicks from 10-meter mark will start after the 6th foul in each half. Foul count will restart at half time. · Teams must wear a full uniform set (shirt, shorts, and socks). · Slide tackling is allowed, as long as it is done in a safe manner and does not put other player in harm. Otherwise, the referee may caution the player.